The MagicMail server has been designed specifically for the ISP & Telco industries. 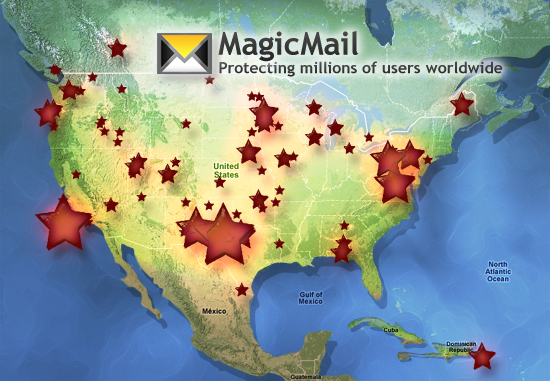 It is fully scalable and the MagicMail user range is anywhere from five hundred to hundreds of thousands. Hundreds of top-tier North American Telcos rely on MagicMail every day, and thousands of ISPs all over the world are making use of the technology that MagicMail is based on. We are pleased that we can include in our client list companies and ISPs with volumes of over 10 million emails a day, and clients with hundreds of thousands of users. Our clients rave about our support, feature integration and reliability. Not only that, but some of our clients use our software to resell and outsource their email services to other companies, providing mail service to several companies and ISPs all from one server. Because we've been servicing the ISP & Telco industries since 1997, there's a good chance that we are already dealing with clients in your same marketplace.